Vs. Pinball © 1984 Nintendo. A great pinball simulator game from Nintendo. Enjoy a familiar pinball game where the player controls the paddles of a virtual pinball machine. The game has two screens to represent the traditional pinball table and one for a bonus mode. Play begins when the player launches a ball with the plunger from the first screen the bottom of the pinball table through the top of the screen to the second screen. Play will move to the first screen if the ball falls through the bottom of the top screen and will return to the top screen if the ball is hit back through the space at the top of the first screen. The player controls the flippers on either screen to deflect the ball to keep it from falling off the bottom of the lower screen. 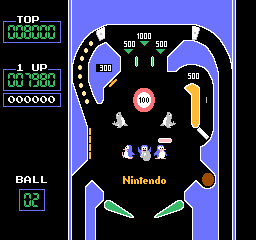 Pinball has some many bonnus and also had a secondary Breakout like mode, which the player reaches by hitting the ball into a bonus hole that takes the player to a bonus stage where they control Mario carrying a platform. The object of this mode is to rescue Pauline. The player achieves this by bouncing the ball on the Mario's platform and hitting various targets, the destruction of which also earns them points. When the blocks under her are all gone, she will drop. you must catching her on Mario's platform to earns bonus points, but you must release pauline it in one of the side platforms and not let it fall, while holding the ball bounce to continue to earn points until the ball falls and go to start. Vs. Pinball was released in the arcade as part of Nintendo's Vs. series, allowing to players to sit or stand opposite one another in order to play head to head. Vs. Pinball was released in the arcades in November 1984. Due to extra memory allocation, Vs. Pinball contains a few features that Famicom Pinball does not have, many of which increase the difficulty of the game. Cameo in WarioWare - Twisted! (2005, Nintendo GBA) : One of 9-volt's games is based on the Arcade Pinball's bonus game. LCD Handheld game [Game&Watch - Multi Screen] (1983) released by Nintendo.